After yesterday’s success with the fly, you’re ready for anything, right? 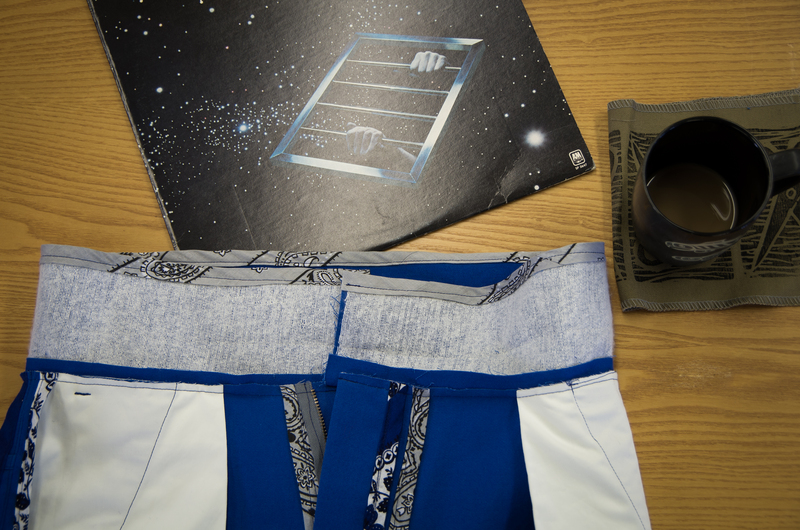 Well here’s what we have coming at us today: The belt loops, the waistband and then, the button/closure on the waistband. A big day! But it’s totally achievable (and couldn’t really be separated) because the belt loops are finished after the waistband has already been started…so before you know it all you will have left is hemming! First off, iron your fusible interfacing onto the waistband piece if you haven’t already. I like to use a medium weight interfacing for this but you might also like to try a heavier interfacing if you are using something thin such as a linen. It’s nice to have a lot of structure in this area. Next, I’ll show you my belt loop method that DOESN’T involve making a tube and turning it (painstakingly) the right way out…I really can’t stand doing that! 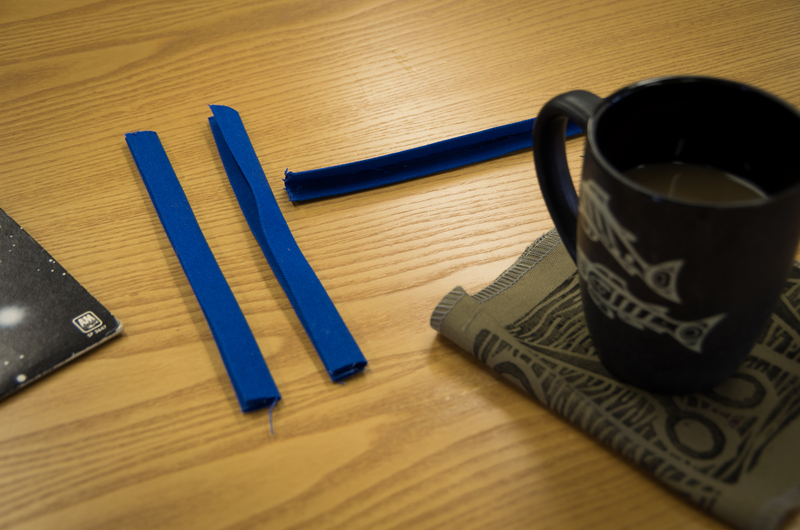 Instead, we’ll prepare the belt loops by folding in each long edge 3/8″ and ironing. 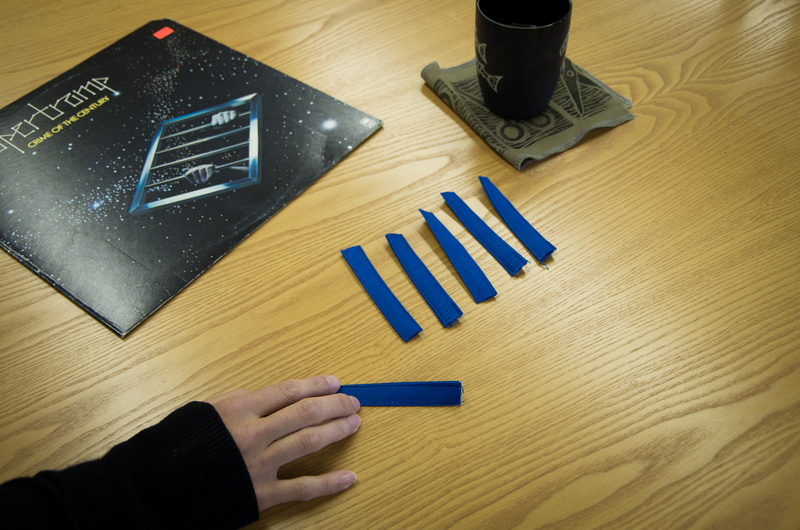 We can now fold them in half and iron, just like making bias binding. 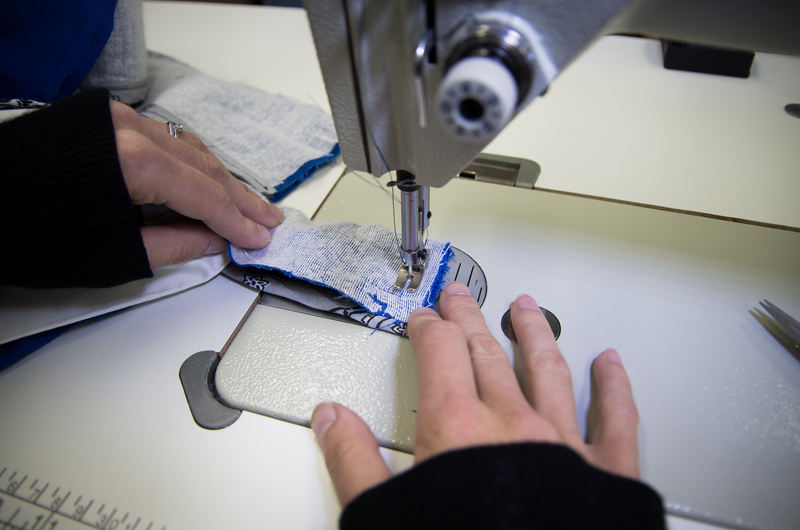 To finish the edges, all we have to do is top-stitch 1/8″ from either edge (the folded edge and the open edge) and give them a press. To make enough belt loops for the shorts (or pants), just cut each belt loop in half. 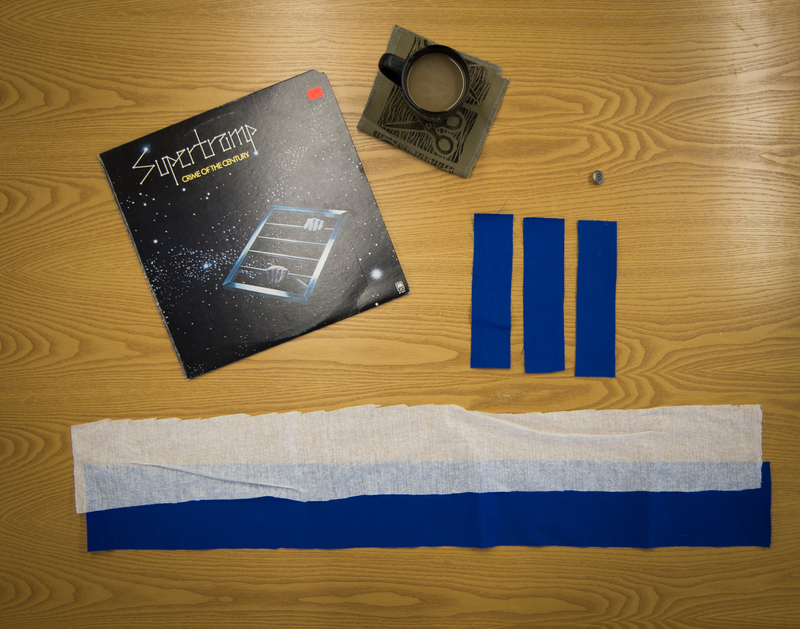 There will be one extra strip so toss (or save in your scrap bin?) the one that has the ugliest top-stitching. 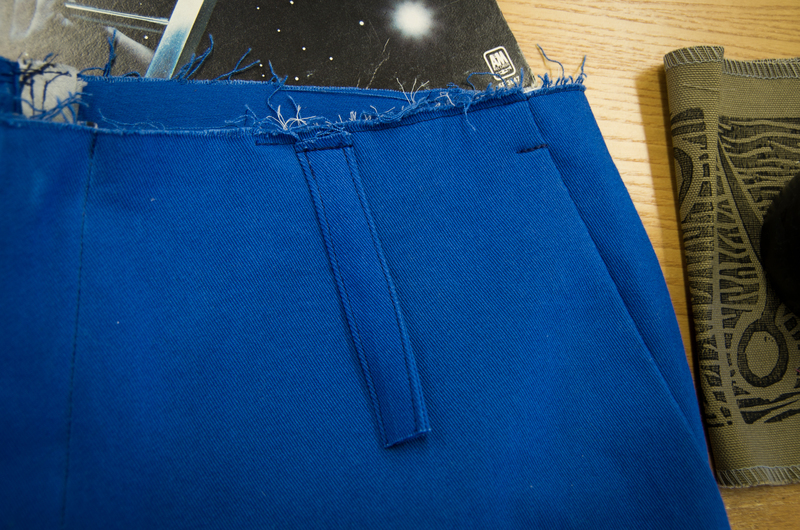 Now that the belt loops have been made, it is time to position them on the pants in preparation to sew the waistband. 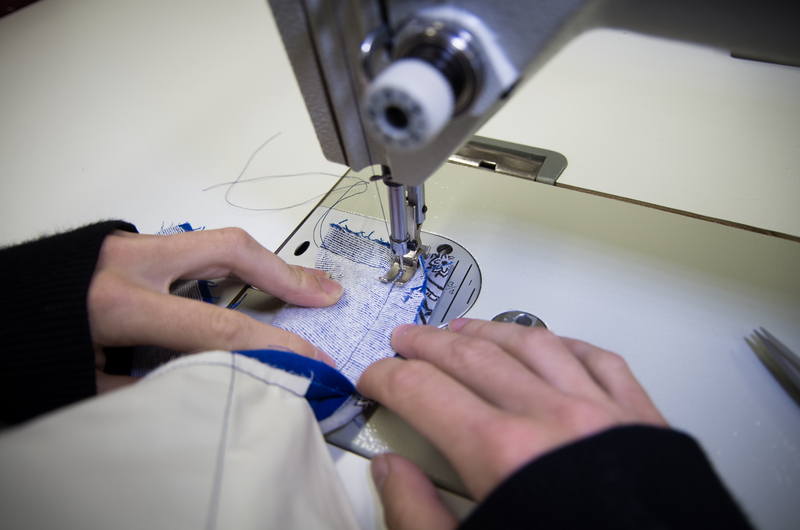 We’ll do this by pinning them with the right side facing the right side of the pants (choose whichever side of the belt loop you had facing up on the sewing machine bed when you were top-stitching as your stitches will look nicer on this side). Pin them with one raw edge of the belt loop lining up with the raw edge at the waist of the pants and the rest of the belt loop extending downwards. 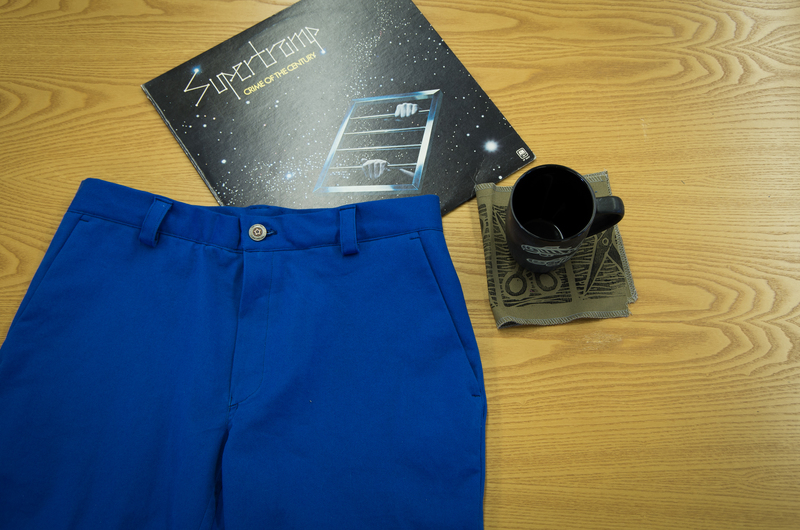 Choose your placement based on the line diagram in the instruction booklet (or based on these photos here), or you could place the belt loops as per the wearer’s favorite pair of RTW pants. You could even use the extra belt loop to form an ‘X’ shaped double belt loop at centre back if this is your preference. 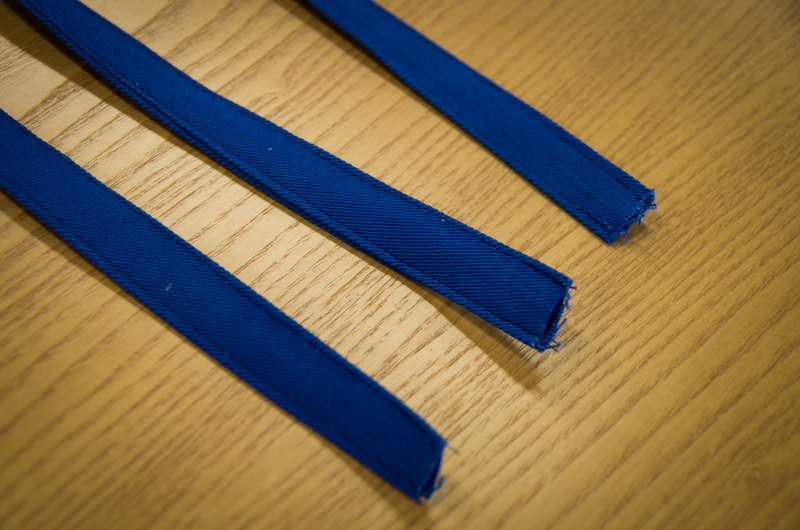 To keep the belt loops in place while stitching the waistband, we can simply baste along the top of each loop. And now it is time to begin the waistband! 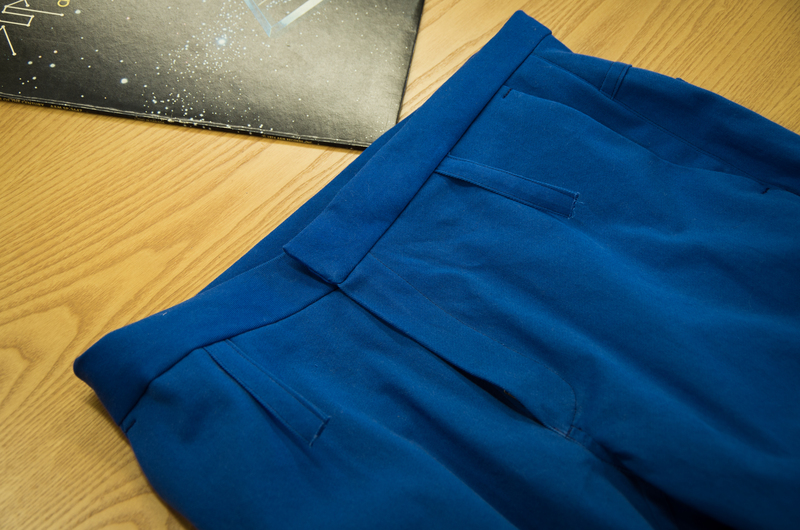 Place the waistband and pants with right sides together and match up any notches while pinning in place. 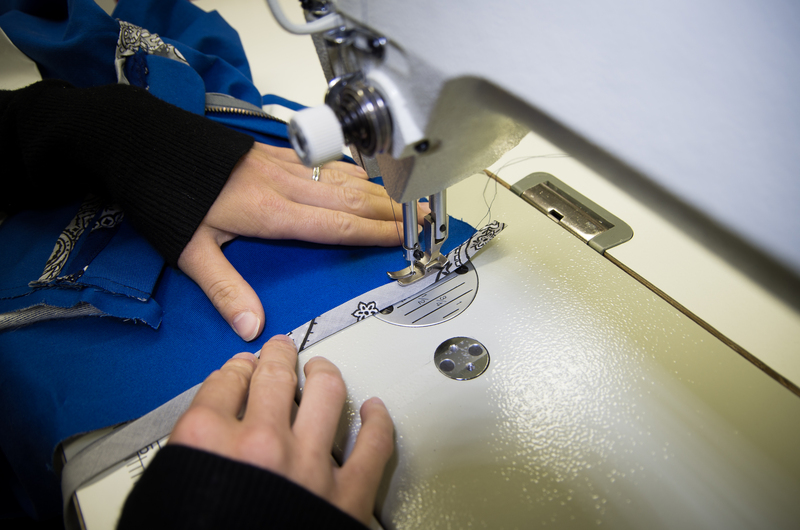 Be very careful when you sew over the zipper – it is safest to use the hand crank on your sewing machine instead of the electric foot at this point so that you have time to shift the zipper teeth out of the way when you feel the needle hit them. Either that or you can wear goggles as is done over at Cation Designs! 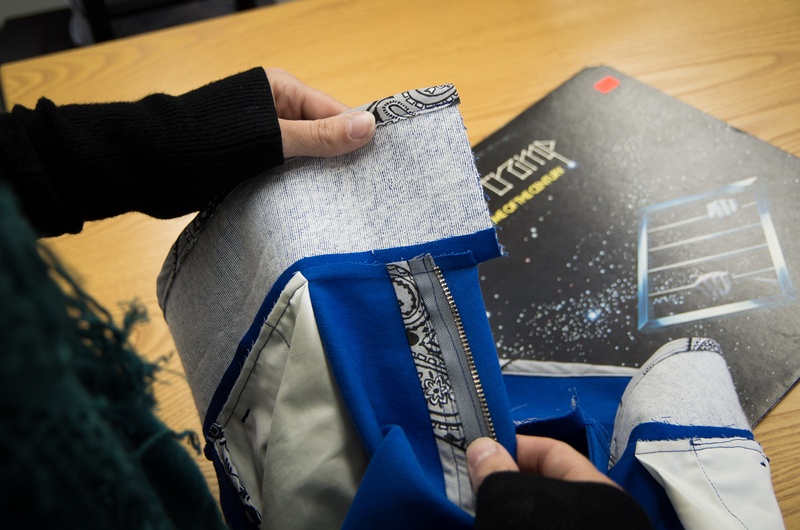 Once that is done, we must do quite a bit of grading – this area can get pretty bulky so trim the pants seam allowance and the belt loop seam allowance short and keep the waistband seam allowance long to eliminate this issue. Good! 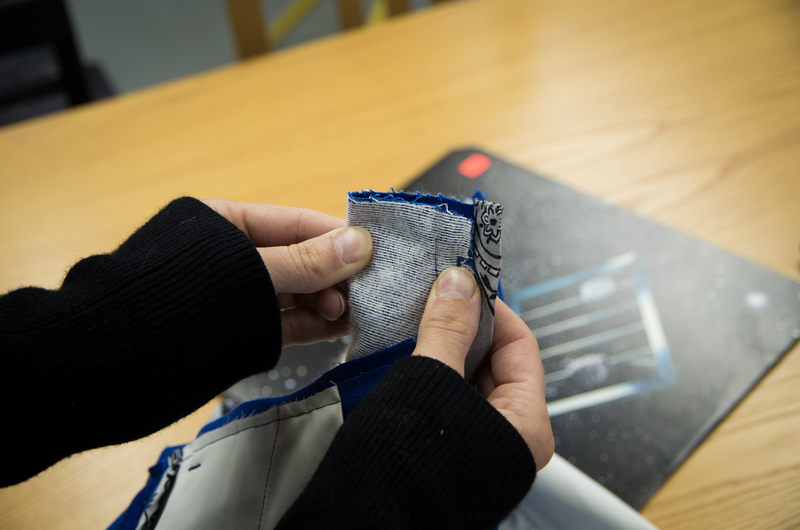 Now, let’s apply the binding to the long raw edge of the waistband. When test sewing, Meg of Made by Meg mentioned to me that she prefers to apply the binding to one of the waistband edges before she sews it on to the pants so she doesn’t have to deal with the bulk of the pants while completing this step. Feel free to do this! The only reason I sew it on afterwards is because I don’t find the bulk bothers me at all (maybe it’s because everything feels small and un-bulky compared to sewing massive duvet covers for my work with The Heather Company!). 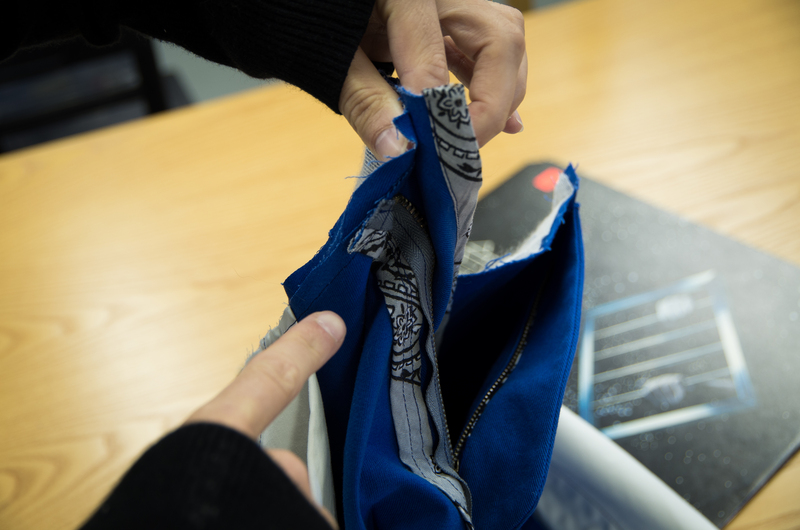 Note that the raw edge of the binding is lined up with either end of the waistband – there is no need to tuck it under to create a finished edge as this will be tucked inside of the waistband later on. Wow, don’t those insides look nice?! 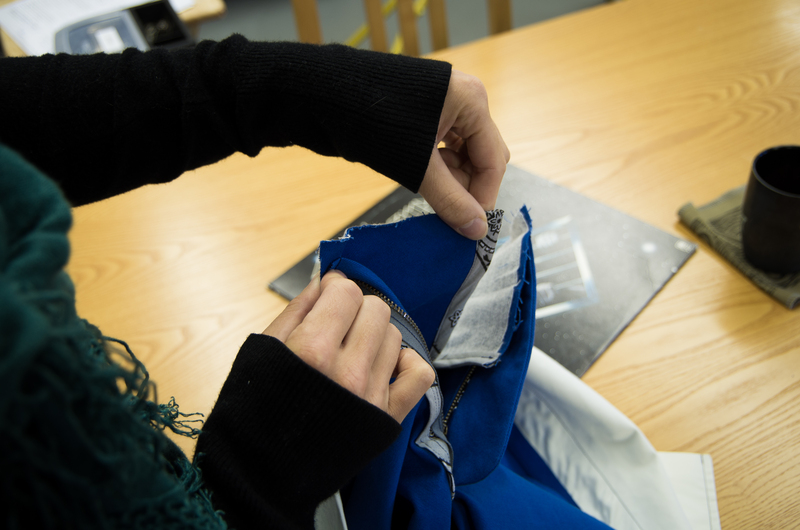 To begin sewing the corner, we have to fold the waistband in half with right sides together with the raw edges of the waistband (well, one raw edge and the other bound edge) lined up. 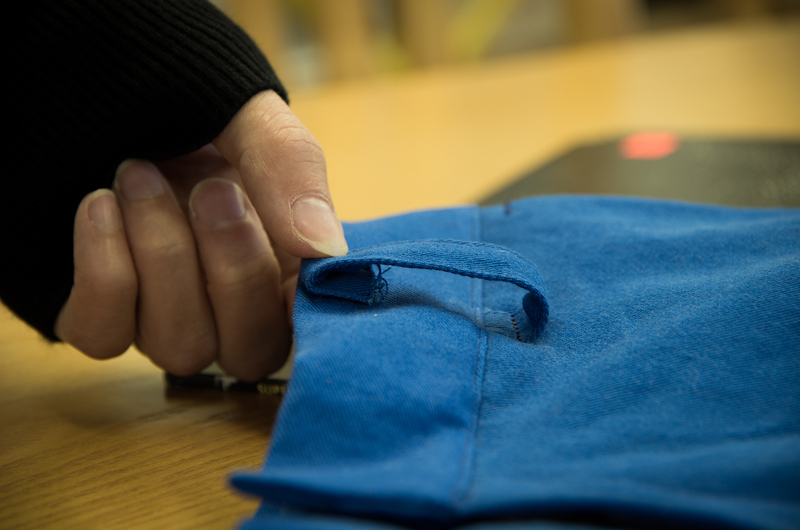 In the photo below, my left hand is holding the bound edge of the waistband and my right hand (the lower hand) is holding the raw edge of the waistband to which the rest of the pants are sewn. 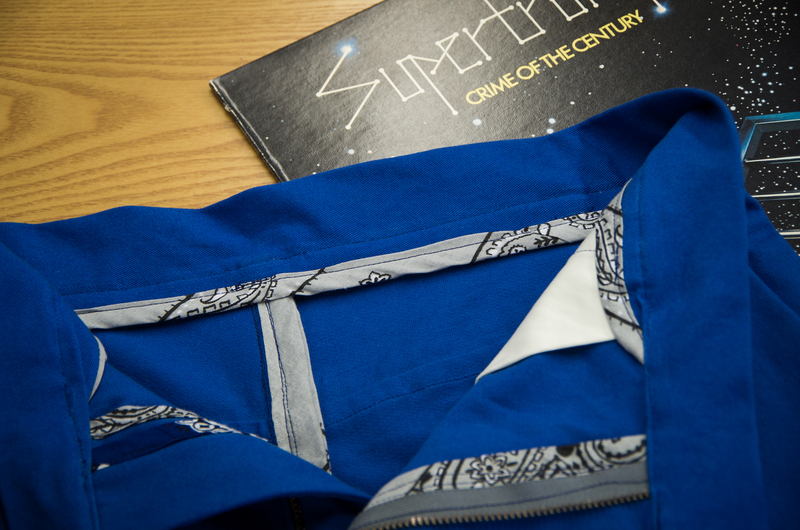 The zipper/rest of the pants are visible in the middle. I am beginning to fold the waistband in half with right sides together. 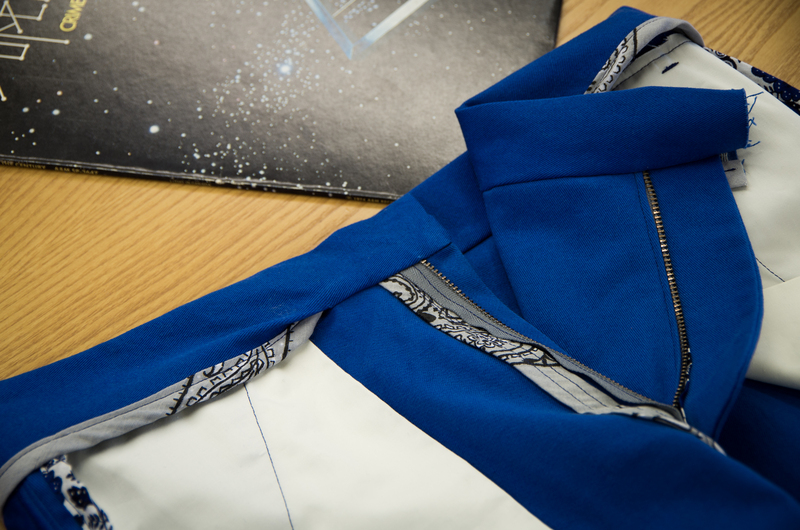 And here is the bulk of the zipper and pants being sandwiched in between (and pushed away from the short edge of the waistband so it is out of the way). Keep a firm grip on what you’ve done so it doesn’t become unfolded and place a few pins in if it will help you to keep things in place. 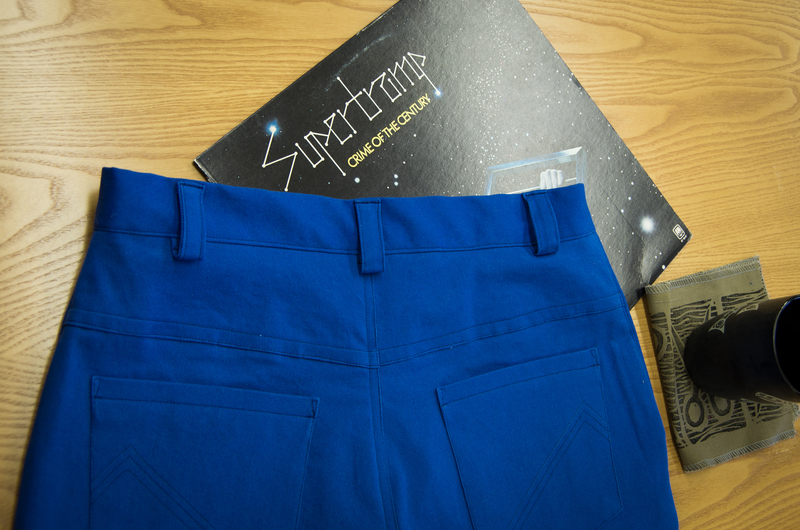 (The photo below is a good example of how far the rest of the pants have been pushed inside of the waistband, and then to the left, out of the way). 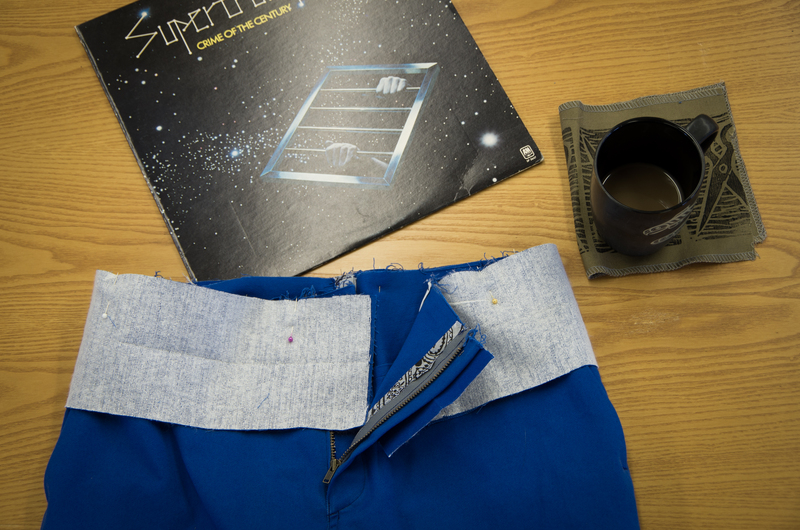 …and then pivot and stitch (with the shorts/pants tucked out of the way inside the waistband) approximately 2″ along the already stitched line, this time catching both layers of the waistband. 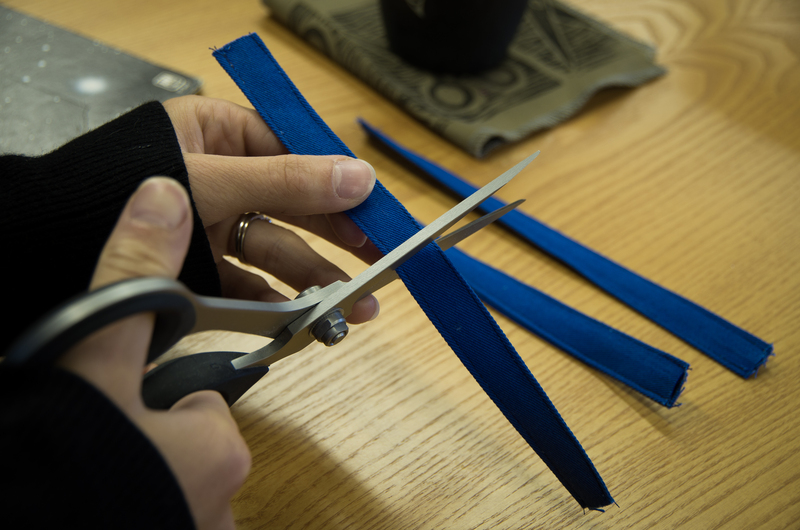 Once the waistband is turned right sides out, we must carefully poke out the corners (a knitting needle works well for this – try to avoid using the tips of your scissors…they’re handy but wouldn’t it be disastrous if you snipped a hole in your fabric after all this work?) and press everything flat. Here is what the inside of my waistband looks like at this point (I’ve only sewn one waistband corner). 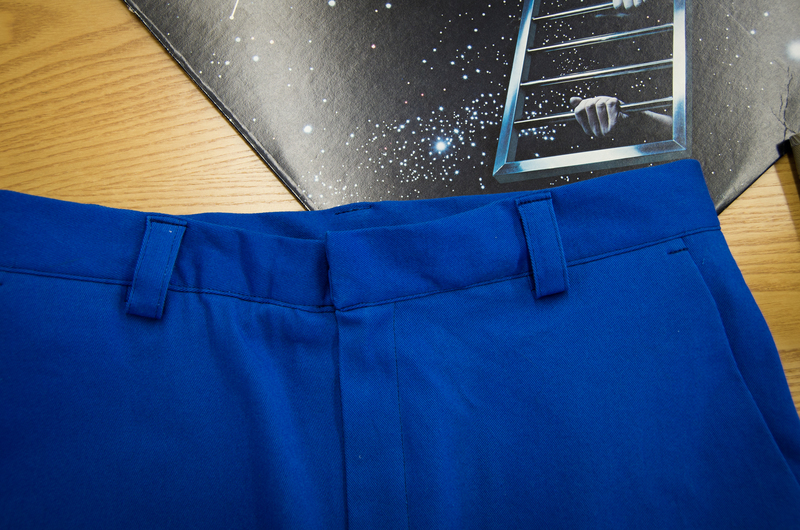 You can see how the bound edge of the waistband tucks into the finished corner. 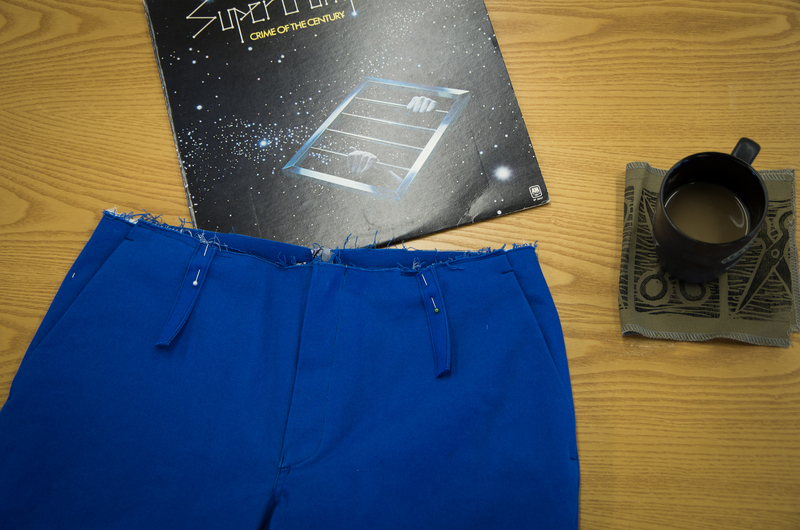 Flip to the right side of the shorts/pants and edge stitch 1/8″ away from the bottom of the waistband, catching the inner waistband and sewing over your pins as you go. Now it’s just a matter of finishing our belt loops! While the belt loops are still pointed downwards, stitch across them, 3/8″ from the bottom edge of the waistband (this simply allows more room for a wide belt). 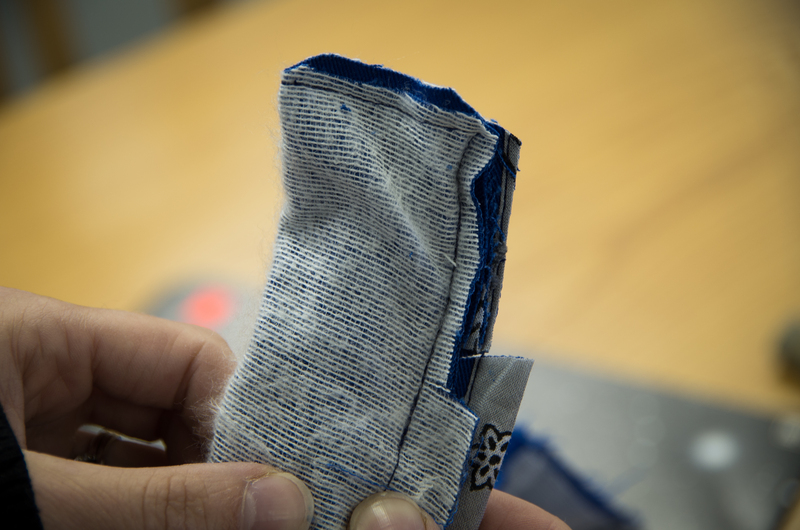 Fold the belt loop up from this point and fold the raw edge under as pictured below. 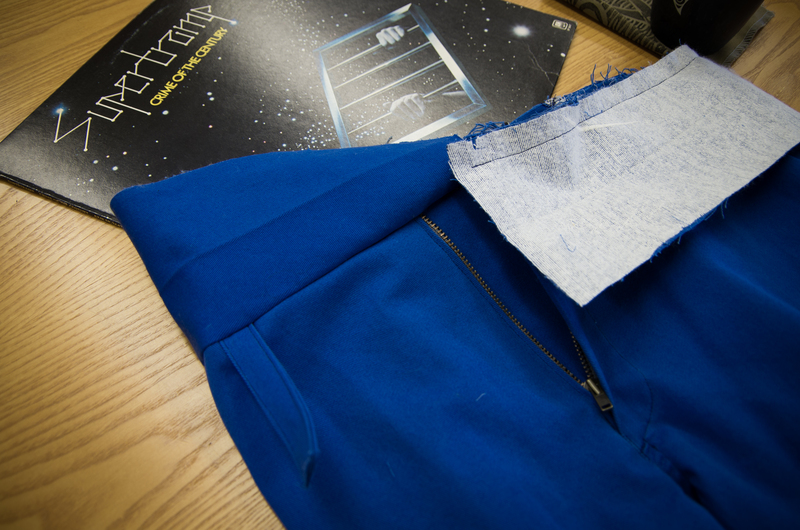 Fold them fairly loosely so there is still lots of room for a belt to be threaded through. 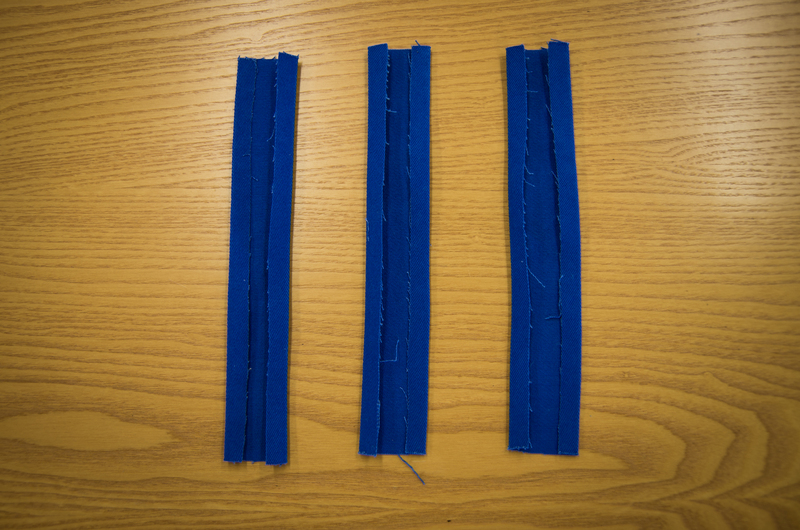 I’ve cut off a bit of excess from the end of the belt loop – how much you cut off will depend how loose you would like the belt loops to be. Stitch across the folded top of the belt loop several times (to make sure it’s extra strong) and, if you would like, trim the raw belt loop edge even shorter. And that’s that! All that you have to do now is add a button hole and button. 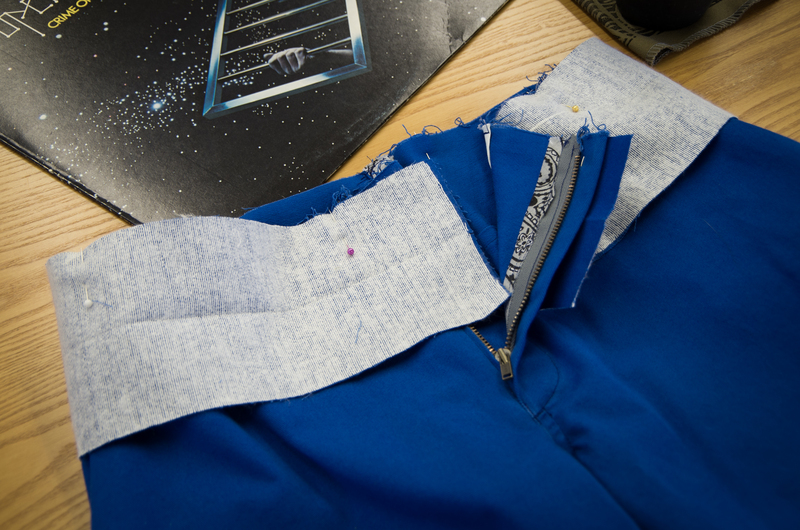 Start your button hole 1/2″ away from the edge of the waistband and sew it horizontally along the waistband. 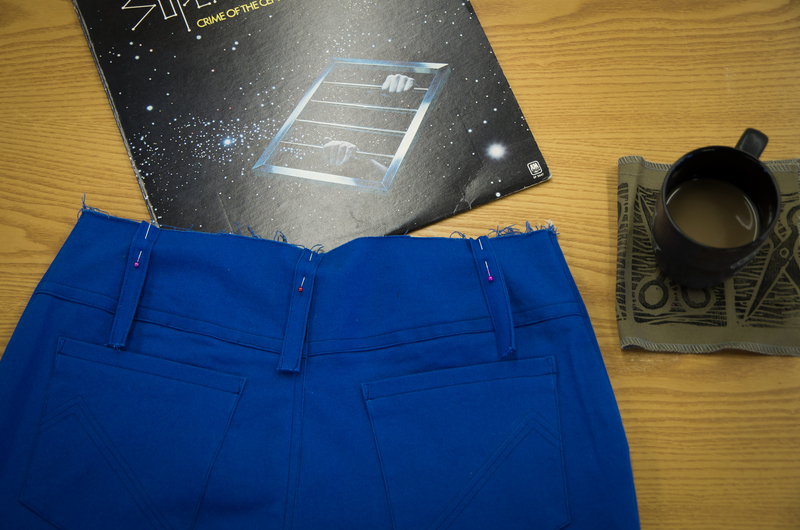 Sew your button directly above the zipper on the other side of the waistband. If you don’t really like sewing button holes (welcome to the club!) and the wearer always wears belts anyways, you could consider hand sewing a large hook and eye (not the tiny little versions meant for dresses, but the big, heavy duty flat ones that are more like clips) to the inside of the waistband. 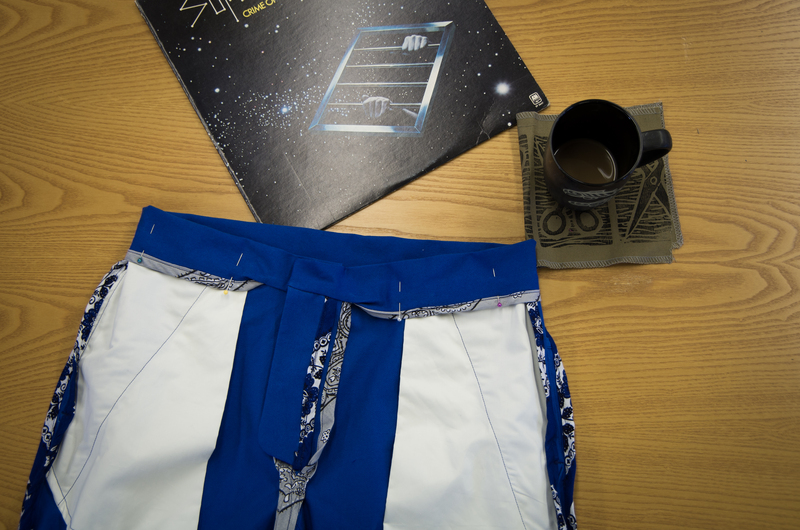 I’ve seen this quite a bit on RTW shorts so I tried it out on Matt’s first version of the Jedediah Shorts and it worked really well! 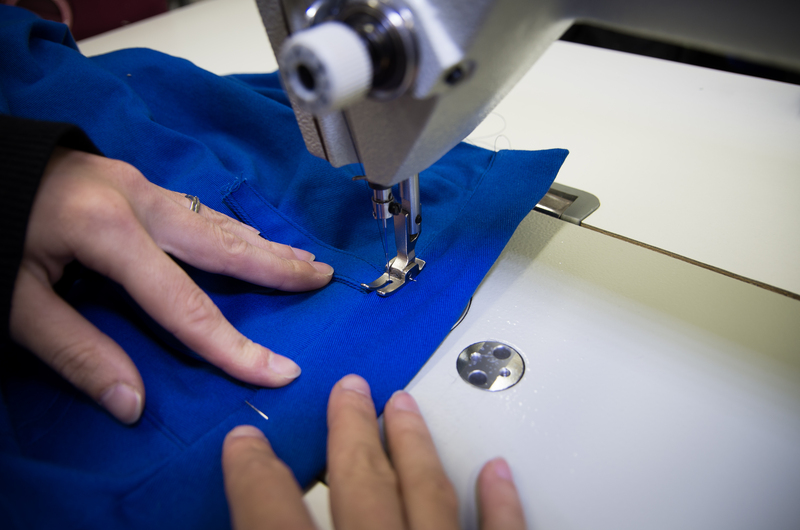 Tomorrow will be the home-run stretch during which we sew the hems and optional cuffs! 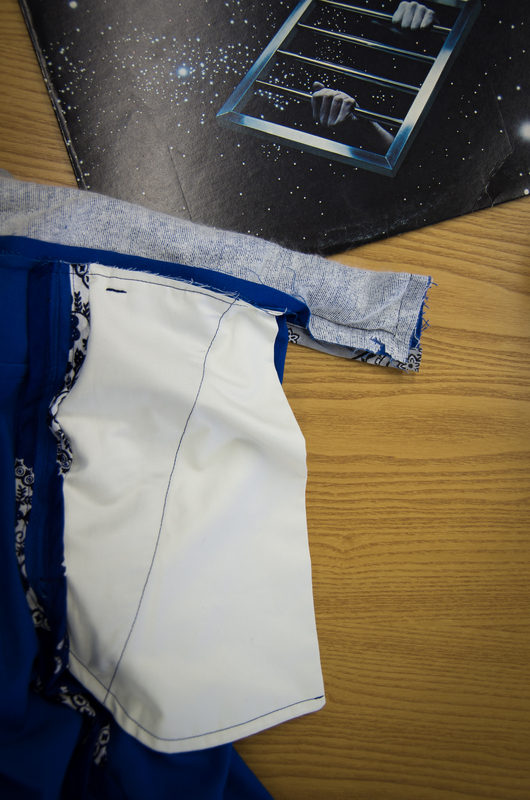 If you are sewing the pants variation rather than the shorts, you don’t need to wait for us…you’re probably too excited to finish them off to wait a whole day just to sew a simple 3/4″ hem! 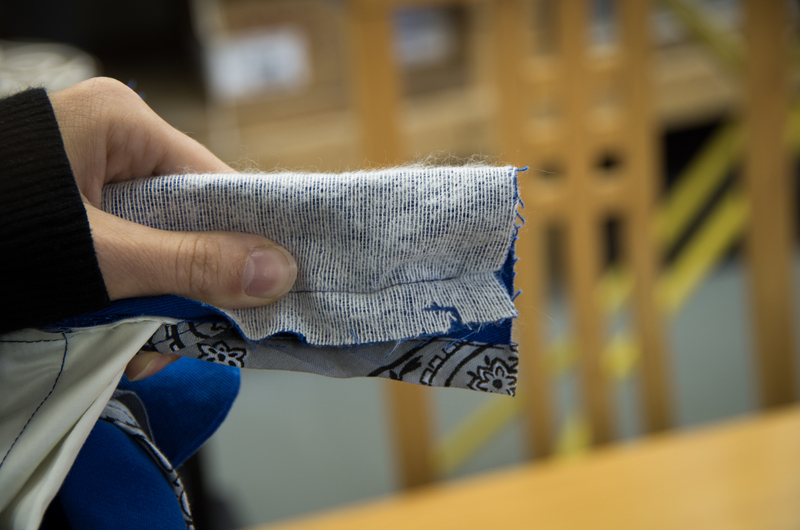 For those of you doing cuffs – these are super easy cuffs that allow us to display all the hard work we put into seam finishes! See you tomorrow! Categories: jedediah shorts, Jedediah Shorts Sew-along | Tags: sew along, waistband | Permalink.